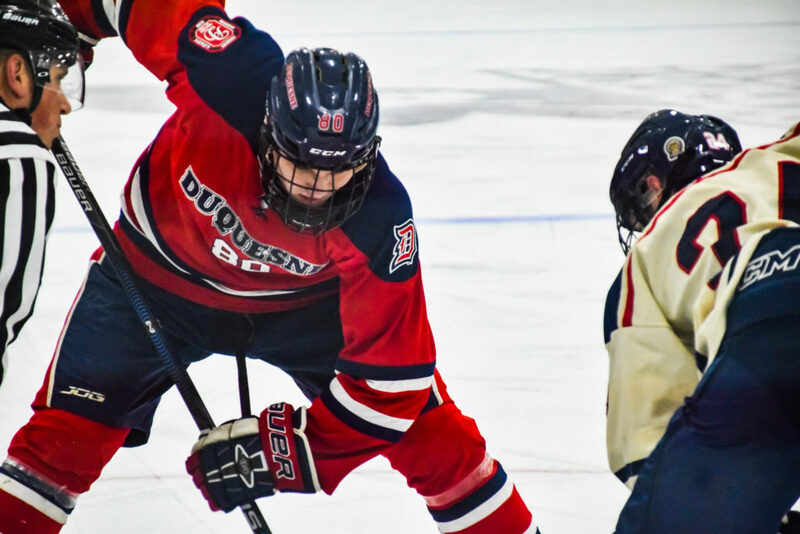 MOON TWP., Pa. — The Duquesne Dukes continued an impressive season by defeating the Robert Morris Colonials, 4-3, in a shootout on Friday. They fell to Slippery Rock, after defeating the Pride 4-2 one week prior, on Saturday, 4-3. Duquesne continued to use the youth in their lineup to their advantage. First-year junior forward Justin Todd scored two goals in the second period and sophomore forward PJ Breslow netted the winning shootout goal. It was an all-around solid performance for the Dukes as they limited themselves to three penalties during the game. Todd’s second goal of the game took the lead back at the end of the second period just after Steven Ralston tied the game at one for Robert Morris. With just under four minutes to play in the third period, Noah Raymundo tied the game again for the Colonials. Dukes team leader in points, Sean Lloyd, broke the tie on an unassisted goal less than two minutes later. When it looked as if the Dukes would hold on to the victory, Joseph Zottola, Jr. put in the Colonials’ third game-tying goal with 24 seconds remaining. Duquesne would manage to hold off a barrage of shots in overtime and take the shootout 2-0 for the 4-3 win. While it was clear that Slippery Rock had no intention of leaving Alpha Ice Complex with a loss, The Dukes wasted no time scoring as Sean Lloyd extended his points streak to three games with a goal just under three and a half minutes in, assisted by Daniel Bigley and Justin Todd. The Pride tied the game at the end of the first on an unassisted goal by Thomas Kimmick, who would go on to score the game-winner and take the Slippery Rock team record in career goals scored at 93. In the second period, Lloyd once more got on the board early, extending the Dukes’ lead to 2-1, again assisted by Todd, who has five points in the past three games. Less than a minute later, Brandon Kozak would give the Dukes a 3-1 lead and Dukes goaltender Alex Taylor continued his best interpretation of a brick wall, facing 59 shots in total. Unfortunately for the Dukes, the Pride would not quit. Jamie Mauro, the conference leader in points with 46, brought his team within a goal midway through the second. Christian Miller tied the game 3-3 with under three minutes to play in the third, and Thomas Kimmick netted the game-winner with 1:06 remaining. The Pride would hang on for the win to sweep their own weekend, having defeated Mercyhurst the night before. Duquesne fell to 8-9-1 on the season and 7-3 in conference play, still holding the conference lead over IUP by two points. Slippery Rock improved to 11-6-2 overall and 4-1 in conference play, tied for third place with Robert Morris. Duquesne’s Friday night win put them two points ahead of IUP, albeit with two more games played. Pitt split their weekend as well, making a surge upward in the standings over their past three games. Slippery Rock has translated their early non-conference success into conference victories as they get into the meat of their schedule and IUP has lost three in a row and four of their last five after going on a six game win streak to start conference play.